Ceci: The first "IRL" residency I attended was the performance for Club Internet. Some have grumbled that this "performance" was boring -- just a bunch of people around laptops. But I stayed at the gallery for almost two hours, talking to Laurel about the use of (and resistance to) digital manipulation in commercial photography during the 1980s, the subject of her academic research that preceded her blog iheartphotogaph. I also had an interesting talk with Club Internet founder Harm van den Dorpel. I don't know if we really needed the gallery setting or even the production of Club Internet in the background to have that kind of dialogue. Brian: Perhaps, but I liked how "IRL" scheduled their activity in the gallery as an event. Watching artists at laptops might have been boring, but making a display of the working process, I think, was the point. There's a lot of talk about the immateriality of art and other content online. I thought the title "In Real Life" was ironic, since the series of residencies challenges assumptions of what is or isn't real, by presenting bodies at laptops, the physical (and hence "real") side of the internet. Not every residency was as antisocial as Club Internet's. Why + Wherefore invited visitors to sit next to them at their computers and make playlists on iTunes or do funny image searches. They used their residency to reinforce social connections. But as with Club Internet, it was a process that occupied space and used equipment. Ceci: The dullness of Club Internet's performance was also what made it authentic. Pull away the curtain and go behind the scenes, and all you see is a bunch of people sitting around their laptops. I agree, Why + Wherefore's segment was more fun, but that's because, instead of staging the production of an online exhibition, they used their residency as an opportunity to celebrate their site. Brian: Other participants were more conscious about representing themselves as artists. 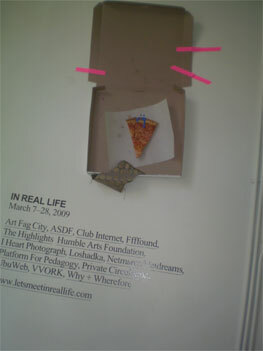 Netmares/Netdreams, like Club Internet, spent their residency making an exhibition, but they took a literal approach to the title of "IRL" and installed objects in the gallery. Loshadka did the same, but it only took them fifteen minutes to fill the gallery with junk, dribbling paint on rags, stapling pizza to the wall and so on, before they resumed screen-based activities. The coincidence of Loshadka's appearances at "IRL" and Light Industry in the same week was illuminating because they were so different: a chaotic free-for-all vs. a quiet video-art screening in a dark room. It demonstrated the possibility of a variable practice, where a blog is just one of many activities, and upended the notion that online work has to be translated to physical space. Ceci: In the introduction to last fall's issue of Vague Terrain, "Curediting: Translational Online Work," the editors cite Walter Benjamin's essay "Task of the Translator" as a means to reconsider the position of the curator of new media art. 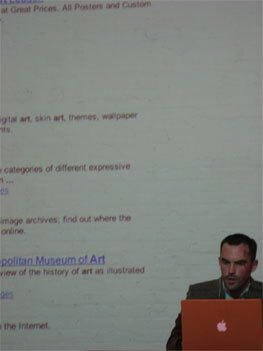 Just as Benjamin's translator must negotiate the porous and reciprocal relationship between two languages with the awareness that the original and translation are never fixed categories, the curator must also "translate" the original work to the context of its exhibition, whether online or off, with an attuned sensibility to the circularity of that exchange. Domenico Quaranta has an essay in there, "Lost in Translation. Or, bringing Net Art to another Place - pardon, Context," where he interrogates the assumption that the function of the new media art curator is to facilitate and find a home for the technology behind the work. This concept of the curator's job inaccurately frames his/her duties as a mediator between two separate spaces (online and off), when, in fact, the curator acts as a go between within two different contexts. Taking from "Task of the Translator" again, Domenico wishes to complicate the idea that translation is a simple transmission. As curator of "IRL," Laurel gave participants free run of the gallery, sidestepping the formality of a stock "new media art exhibition" which would potentially entail the limitations discussed in Vague Terrain. She had the advantage of working in the small, DIY space of Capricious, without the trappings of a big institution. As you point out, her approach ultimately foregrounded the multiple disciplines present in the practice of many of the participants. The technology was certainly visible, but I don't think it dictated the conversation. Brian: I agree that Laurel escaped the issue of technology and translation by limiting her role to selection and organization. Her big gesture as a curator was the idea to put web sites in a gallery. Linguistic translation is about going back to the pre-verbal, to the idea behind the text, and finding the best way to express it in the new medium. The translator has to be a good reader to determine the back story of the original, while negotiating the slippery systems discussed by Benjamin. Laurel chose the end medium, Capricious, but let the participants be their own readers. They had to reflect on their work and decide how technology is relevant to it. 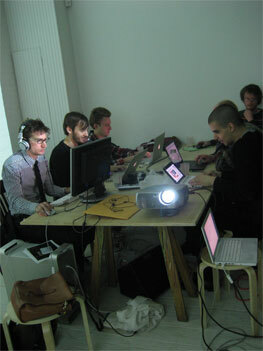 In the end, almost everyone brought computers to the gallery, but nonetheless, many of the results can’t be related to the idea of translation. The Highlights spent their four hours gluing a pyramid of cards to the wall, while their designers -- the ones who do the work of making the web site -- made and printed posters to advertise their performance as it was happening. They were not trying to represent their editorial activity; they just came up with something to do in a gallery for four hours. Then there was Paddy Johnson, who blogged on site. Visitors could see the back end of Art Fag City projected on a big screen as she posted about Alice Aycock and James Turrell. It evolved into a conversation -- unlike Club Internet, Paddy didn’t want to ignore people as she worked. But it was less like a translation than a transposition, the movement of a domestic or office activity to a public space. Ceci: This takes us back to the perennial question for the curation and presentation of immaterial mediums: what is the object? The most successful residents, I think, were conscious of the performative aspect of their time in the space, and considered the fact that, to a degree, they themselves were the object. Perhaps the best example is Tyler Coburn's performance, a "guided tour" of the internet. As he recited the audio from Andrea Fraser's Museum Highlights, a 1989 performance in which she gave a parodic tour of the Philadelphia Museum of Art, Tyler used keywords from the speech to surf the web. This lead to unexpected and comedic results. Although Tyler was behind his laptop the whole time, it was enjoyable to watch. Image: Tyler Coburn "Docent Tour of Art on the Internet"
But I think you're on to something with the performative aspect, the idea of making something to fit the limited time and setting in Capricious. We talk about internet art as ephemeral, but time spent in a gallery -- and thus the experience of any art -- is equally so. By constructing a temporary space in which to bring the producers and the audience of internet content together, Laurel was able to put the reality of these connections into relief. "But I think you're on to something with the performative aspect, the idea of making something to fit the limited time and setting in Capricious. We talk about internet art as ephemeral, but time spent in a gallery – and thus the experience of any art – is equally so. By constructing a temporary space in which to bring the producers and the audience of internet content together, Laurel was able to put the reality of these connections into relief." You know, I've never thought of that, how the internet can compare to art in that way. It's quite beautiful to be honest, thanks for the insightful read! wow, this post by "Tyra" is amazing…is this spam in the form of art discourse? How is it spam? By simply leaving a link? Just saying that I liked the post, and hadn't thought about the internet like an art gallery.. Reminds me of "Library" by Levinson. When she scheduled people to go to the library en masse and read. Brilliant, I say. "With Mylinh Nguyen sitting in the gallery and David Horvitz chatting live from Golden Age in Chicago, ASDF [made] available an ephemeral show of 48 artists existing for only 4 hours. Each art work [was] available, one at a time, for only 5 minutes. The works [were] sized to print and available for download (also including instructions so that viewers may print the works using basic consumer technologies). After the 4 hours are up all the original files [were] deleted." The 8 1/2 x 11 artworks inkjet-printed and hurriedly taped to the wall in a line around the room were nothing to write home about but it was interesting to see the webcam projection of the crowd in Chicago with their identical group of objects in a line around their room. It felt like looking through a doorway into a parallel universe. Who are these people standing around with their Chicago versions of the art? Is that Chicago-me mugging for the camera? ASDF''s was a work that took the real time/real space aspects of the gallery presentation into account, the internet vs white box dynamic, as well as the crowd or party vibe that became part of the art. By the way, speaking of IRL, how about the insightful spam in these comments? I forgot to plug my online pet grooming service. Just a link does not spam make…. Am I spam because i have an<a href="http://axetheacne.com">acne</a>site?